We help children achieve their full potential through experiential learning. We are experts in the field of French camps, eco-friendly, and critical thinking and awareness programs. Check our the video we prepared on the left to showcase What We Do! In suburban Mississauga in 2001, we launched our first program: Camp Tournesol’s French day camps. Our unique brand of fun and hands-on French summer day camps have become our flagship experiential learning programs, welcoming thousands of campers each summer throughout the GTA. 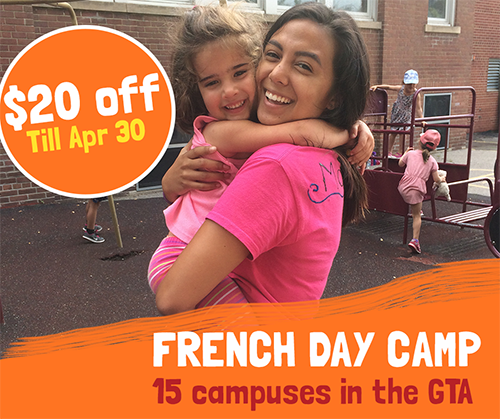 We offer French day camp programs for all levels of French to campers aged 4 to 14 years old. In 2019, we established new set of English eco-friendly day camp programs. Our “Love My Planet” eco-camps help develop the next generation of eco-conscious children through exploration and creativity. Campers’ passion for the environment is front and centre, all while having fun in a day camp atmosphere! Click here to learn more about our different day camps, specialized for each age groups and offered throughout the GTA. In 2007, our French overnight camps joined our French day camp programming and we began welcoming an enthusiastic cohort of French campers looking for a more immersive experience. All programs are offered within 2 hours of the GTA and, and allow children to discover the great outdoors while speaking French all day…the next best thing to spending a week in Quebec’s countryside! These camps are exclusive to students age 8 to 14 already fluent in French (French immersion, French schools or native speakers) and are staffed with mostly native speakers from Northern Ontario, Quebec, and France. A full-French environment is maintained 24/7 throughout the entirety of the trip, fully immersing campers and strongly enriching their French skills, all while enjoying the adventure of French overnight camp! In 2016, Great French Tutors was born to continue to support our families year-round. 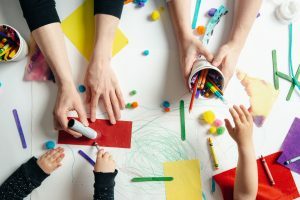 Offering one-on-one French tutoring, Great French Tutors provides high quality French programs tailored to each child’s learning needs, in support of the Ontario French as a Second Language curriculum taught at school. From the comfort of your own home, your child can meet with a French tutor online at a time convenient for your busy schedule. Our team of bilingual French tutors are hand-picked from the best of Camp Tournesol’s camp counsellors for their exceptional skills in supporting elementary and secondary students in their journey with the French language. With Great French Tutors, we focus on one-on-one targeted support, which could include specific French language skills or simply homework, with repetition, positive reinforcement, and most importantly lots of practice! Students benefit from the individualization and can see themselves improving session after session. In 2018, we launched a formally structured French classroom environment. The Brouillet French Academy is a more focused, curriculum-based, and rigorous French program where students meet a live professor once a week for 90 minutes in a virtual classroom to develop and enrich the 4 areas of French skills (speaking, listening, reading and writing), aligned with the CEFR (DELF levels). French Classes consist of no more than 8 students of the same language level, all working towards a common goal. Professors use reflection, targeted feedback, and real-world applications to solidify student learning Structured conversation classes are also offered during select semesters. A high quality French learning experience, live from your home! Overnight School Trips and Outdoor Education Programs. In 2017, we introduced our specialized unique programs to support schools. In Ontario, we are the only provider of French school trips! Using our expertise in experiential learning, leading overnight trips, and developing students’ French communication skills, we organize educational French School Trips to support classes and schools who share our vision: that conversation and practical application are the keys to language success. Trips are available in the fall and spring for French Immersion and Francophone classrooms throughout Ontario, and are all customized to meet the learning goals of each class in attendance. Whether it’s developing teamwork skills or learning more about Ontario’s geography, our trips can enrich students’ learning journeys, all in French. Our highly trained and dynamic animators are thrilled to visit classrooms and schools, bringing engaging and active French workshops to students, all with the goal of promoting in-school French speaking. New in 2019, eco-friendly workshops also include developing awareness about our ecological footprint, reducing our use of plastics, and making the best upcycling projects! Contact us for more details at info@campt.ca.